TCombining experience and quality service in the tourism sector with international contemporary hotel concept, uninterrupted change and breakthrough principle, provides a professional service with requiremenets of a 5 star hotel. Our hotel offers you the options you can turn the time you are staying into special times with the social opportunities in and around it to meet your every wish and need. It makes a difference in the point of peace of the city, which has the comfort of your home. 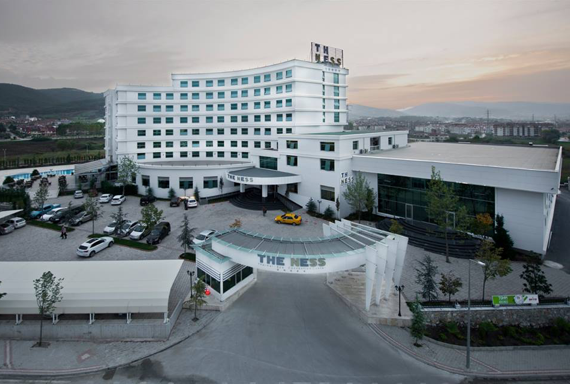 With hospitality, professionalism and high quality service, we are pleased to host you as the family of The Ness Hotel. Your satisfaction is our satisfaction. The remains found in the district show that the Yazlık Spa was built for the first time in the Roman period and that this structure, which had been destroyed over time, was replaced by a vaulted structure built during the Byzantine period and also used in the Ottoman period. In the Spa (Ayazma), which is located within the boundaries of the Gölcük district at the 8th km of the Kocaeli-Gölcuk Highway, the water, which is currently used is analysed by Prof. Dr. M. Zeki KARAGÜLLE, who is the head of the department of Medicine, Ecology and Hydroclimatology of the Faculty of Medicine of Istanbul University. It has been determined by M. Zeki KARAGÜLLE that it regulates sedative analgesic endocrine functions and that it is good for many diseases and that the water temperature is between 22 ° C and 37 ° C.
In our territory, in the operation of Termal Hotel, keeping our values and being conscious of being the single and pioneer enterprise, responding to the expectations of business and entertainment world of the region with the standards of five star hotel and keeping guest satisfaction at the highest level. On the basis of guest satisfaction, to enhance principles and employees' abilities to the highest level and to be recognized as the most qualified of the class as an international brand preferred by the guests, without compromising the superior quality understanding.